If you search the web for symptoms of nutrient toxicities you will often find clear pictures and descriptions for most elements. Feed a plant too much nitrogen and it will grow leggy and weak, with dark leaves and long stems, feed it too much boron and you will see yellowing and tissue necrosis. However you will struggle to find descriptions for toxicity symptoms for potassium (K) or phosphorous (P). Is there really no P or K toxicity? Why are they no pictures or clear ideas of how these problems look? Today I am going to talk a bit about P toxicity and why it's so difficult to reach levels where plants react very negatively to ions from the phosphate family. Images posted were taken from articles cited within this post. You will often find websites that talk about P toxicity as saying that it is rare or that what it causes is mainly problems with other elements. In general increases in P concentration can cause problems with other elements particularly because the solubility of dihydrogen phosphate salts (H2PO4-), salts that form with the ionic form of phosphate that's mainly present around the pH values used in hydroponics (5.5-6.5) can be very insoluble. You will struggle to find solubility values for heavy metal dihydrogen phosphates, but Fe, Zn and Cu dihydrogen phosphates can be reasonably presumed to be poorly soluble. However calcium dihydrogen phosphate has a solubility of 20g/L at 25°C and is therefore very soluble, so no problems with Ca due to having a lot of phosphorous (this salt is also known as mono calcium phosphate). The solubility of Ca dihydrogen phosphate is in fact very important because rock phosphate - tricalcium phosphate - is one of the main sources of phosphorous in soil and it dissolves to form protonated phosphate species at the pH usually created around plant roots. This means that many plants evolved with very large occasional concentrations of dihydrogen phosphate around them and therefore they generated mechanisms to down-regulate the uptake of phosphorous from really high concentrations. There is strong evidence about the above. In fact plants that evolved in phosphorous-poor soils did not evolve mechanisms for down-regulation and do exhibit P toxicity even at moderate concentrations of this element. A few plants native to Australia exhibit this behavior, you can read more about this here. Due to this fact many plants can be cultured in media that is amended with fertilizers that generate large local concentrations of phosphorous when watered without showing any strongly negative effects. Note however that plants will eliminate these down-regulation mechanisms significantly if they are in a P deficient media and if you feed them P rapidly you can cause P toxicity just because the plant couldn't react fast enough to the large increase in P concentration. See for example this study using P deficient Barley which accumulated toxic levels of P upon supplementation although this did not happen when the plants were constantly exposed to high P levels. In hydroponics we do see excess of P manifest itself as deficiencies of other elements because of the solubility issues for heavy metal acid phosphates mentioned above. Several studies show the strong link between P concentration and the availability of some micro-elements. For example this paper shows the relationship between P and Zn and how the relationship corresponds with Zn phosphate precipitation in the roots. However if heavy metals are properly chelated we in fact don't see these problems. I have made experiments with plants - basil and mint - cultivated in 600 ppm of P where I have failed to see any significant problems although I have failed to find any papers that describe experiments under such extreme P concentrations. Is more P always better then? Studies in tomatoes show better responses to salinity at higher P concentrations (for example here). Although the highest concentration tested here is 61 ppm (2mM) which is higher than but still close to what is generally used in hydroponic culture of tomato plants (30-50 ppm). 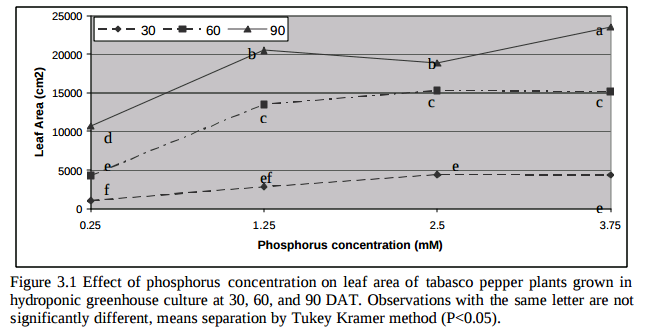 Tabasco pepper has also been found to grow better under higher P concentrations (see here). A study varying P concentration in hob marjoram found lower essential oil concentrations at higher P levels, although these levels are around 60 ppm as well. Lettuce on the other hand shows increases of sesquiterpene lactones at high P levels (see here). There are a few publications about P toxicity in higher plants - notably this one about tomatoes - where problems caused by P are generally associated with the previously mentioned micronutrient issues and P concentrations in leaf tissue above 1%. In summary P toxicity depends heavily on plant type and its ability to regulate P uptake, it is also most likely heavily dependent on micronutrient concentration and the strength and stability of the chelating agents used to prevent the precipitation of heavy metal phosphates. There are no studies I could find with P under very high concentrations (>=20mM) using chelated heavy metal sources so this is an interesting topic for research for anyone interested in exploring the limits of P uptake.